Bent's Old Fort (sometimes referred to as Fort William) is an 1833 fort located in Otero County in southeastern Colorado, USA. William and Charles Bent, along with Ceran St. Vrain, built the fort to trade with Southern Cheyenne and Arapaho Plains Indians and trappers for buffalo robes. For much of its 16-year history, the fort was the only major permanent settlement on the Santa Fe Trail between Missouri and the Mexican settlements. It was destroyed under mysterious circumstances in 1849. From 1833 to 1849, the fort was a stopping point along the Santa Fe Trail. It was the only permanent settlement not under the jurisdiction and control of Native Americans or Mexicans. The U.S. Army, explorers, and other travelers stopped at the fort to replenish supplies, such as water and food, and perform needed maintenance to their wagons. The American frontiersman Kit Carson was employed as a hunter by the Bent brothers in 1841, and regularly visited the Fort. Likewise, the explorer John C. Frémont used the Fort as both a staging area and as a replenishment junction, for his expeditions. During the Mexican-American War in 1846, the fort became a staging area for Colonel Stephen Watts Kearny's "Army of the West". Ralph Emerson Twitchell makes the following statement. Bent's Fort is described as having been a structure built of adobe bricks. It was 180 feet long and 135 feet wide. The walls were 15 feet in height and four feet thick and it was the strongest post at that time west of Ft. Leavenworth. The construction of this fort was commenced in 1828... at a point on the Arkansas somewhere between the present cities of Pueblo and Canyon City, having been disadvantageously located. Four years were required in which to complete the structure. On the northwest and southeast corners were hexagonal bastions, in which were mounted a number of cannon. The walls of the fort served as walls of the rooms, all of which faced inwardly on a court or plaza. The walls were loopholed for musketry, and the entrance was through large wooden gates of very heavy timbers. In 1849 when a great cholera epidemic struck the Oklahoma and other plains Indians, William Bent abandoned Bent's Fort and moved his headquarters north to Fort Saint Vrain on the South Platte. When he returned south in 1852, after salvaging what he could, he burned the fort and relocated his trading business to his log trading post at Big Timbers, near what is now Lamar, Colorado. Later, in the fall of 1853, Bent began building a stone fort on the bluff above Big Timbers, Bent's New Fort, where he conducted his trading business until 1860 when the building was leased to the United States government and renamed Fort Wise. It was there that the Treaty of Fort Wise was signed on February 18, 1861 by the United States and a few Cheyenne and Arapaho chiefs. Old Fort Lyon, as Fort Wise was renamed in 1862, was built of timber by army troops in 1860 about half a mile west in the Arkansas River bottom. It was abandoned and replaced by new Fort Lyon near what is now Las Animas, Colorado in 1867. When the fort was reconstructed in 1976, its authenticity was based on the use of archaeological excavations, paintings and original sketches, diaries and other existing historical data from the period. The fort was the setting of the early episodes of the CBS western miniseries The Chisholms (1979–1980). In Flashman and the Redskins, the anti-hero Flashman is present at the destruction of Bents' Fort. Bent's Fort is featured briefly in Larry McMurty's 1985 Pulitzer Prize-winning novel Lonesome Dove, as well as in the 1989 Emmy Award-winning four-part TV miniseries adapted from the book. Bent’s Fort in the spring of 1834 is a major setting for Terry Johnston’s 1988 novel One-Eyed Dream. Bent's Fort inspired video game developer Rockstar Games to recreate its likeness in the 2010 game Red Dead Redemption as Fort Mercer in the Rio Bravo region. A restaurant named "The Fort" near Denver has architecture and decor adapted from Bent's Old Fort, with motif and cuisine inspired from the region in the 1830s. "Gentlemen" who stopped by the fort while traveling the Santa Fe Trail stayed in the upstairs quarters. The recreation room, mostly for playing cards, was located on the second floor of the fort. ^ "Listing of acreage as of December 31, 2011". Land Resource Division, National Park Service. Retrieved 2012-03-30. ^ "NPS Annual Recreation Visits Report". National Park Service. Retrieved 2012-03-30. 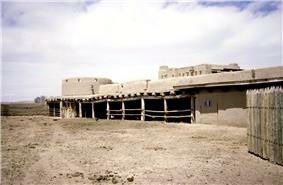 ^ a b "Bent's Old Fort". National Historic Landmark summary listing. National Park Service. 2007-09-28. ^ "Bent's Old Fort or Fort William", April 20, 1984, by Carl McWilliams and Karen Johnson". National Register of Historic Places Inventory-Nomination. National Park Service. 1983. ^ "Bent's Old Fort or Fort William--Accompanying 20 photos, from 1983". National Register of Historic Places Inventory-Nomination. National Park Service. 1983. Legg, John (1993). War at Bent's Fort, historical novel. Siegel & Sigel Ltd.